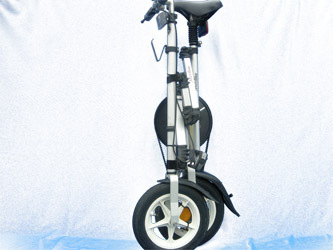 MicroBike is the only existing foldable bike convenient to use in combination with city public transport. A use were you have to fold and unfold several times, handle the folded bike onboard a bus, tram or subway and still enjoy the travel. Is now the time to start producing MicroBike again? 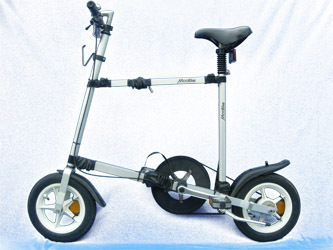 The purpose of this web page is to determine whether you want a MicroBike and would enjoy using it in your short travel needs. 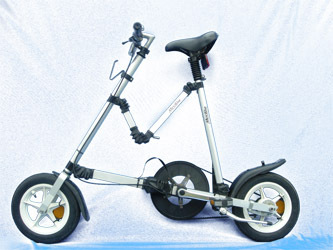 I hope you enjoy learning about MicroBike and then are willing to let me know your interest for a Relaunch. Wrong shape when folded. Moving around in a bus or tram with an object broad and wide is difficult. When it’s crowded – impossible. To heavy when folded. Hard to carry without getting soiled from dirt on the bike. To long folding and unfolding time. Even 30-45 seconds are too much. Arriving to the bus station when the bus arrives and not be able to get onboard fast enough will result in missing the bus. No luggage carrying possibility. Often you have something to transport along with you. This understanding resulted in a requirement specification that we fulfilled with the existing design. Frame of aluminum with six joints to fold the frame. Transmission by cog belt. Wheel size 12.5 in. Attachable luggage carrier and luggage hook. Reflexes and battery lights. 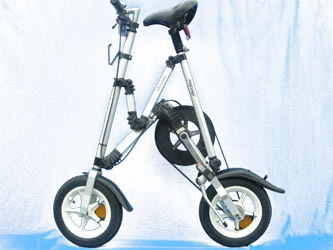 MicroBike was produced in Sweden between 1988 and 1993. 16 000 bikes were sold. The price at the end was SEK 3800, USD 560.